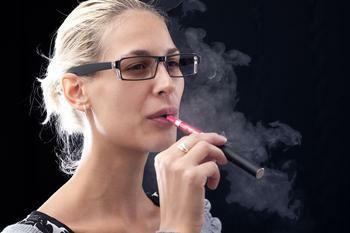 "We believe that the discussion to date has been slanted against e-cigarettes, which is unfortunate, because the big picture tells us that these products appear to be used mostly by people who aready are or who are likely to become cigarette smokers," said David T. Levy, PhD, a professor in the department of oncology at the Georgetown Lombardi Comprehensive Cancer Center in Washington, D.C.
"We're concerned the FDA, which has asserted its right to regulate e-cigarettes, will focus solely on the possibility that e-cigarettes and other vapor nicotine products might act as gateway to cigarette use," said Levy, lead author of a study funded by the FDA. "While e-cigarettes may act as a gateway to smoking, much of the evidence indicates that e-cigarette use encourages cessation from cigarettes by those people who would have otherwise smoked with or without e-cigarettes," Levy said. "We don't want to encourage e-cigarette use by youth and young adults who would not have otherwise smoked. However, the primary aim of tobacco control policy should be to discourage cigarette use while providing the means for smokers to more easily quit smoking, even if that means switching for some time to e-cigarettes rather than quitting all nicotine use," they write in their article. "Increasing e-cigarette prices by taxing them the same way as cigarettes will discourage youth VNP use, but also discourage use by smokers, especially those of lower socioeconomic status, who are trying to quit," Levy added.